Today’s guest post comes from Jason Jenkins who hosts the greatly popular Epic Education family Podcasts and blogs at Epic Education. Jason is a great bloke who I have chatted with regularly, we have appeared as his guest on his podcast which you can listen to here. Jason and his family spent many years living in Asia. Any trip to Japan should include some time in Kansai with kids. The entire archipelago is an amazing place to explore with children, but many of its most interesting corners are missed. The streets of Tokyo, the shrines of Kyoto and the memorial in Hiroshima should all be seen first-hand. However, Japan has much more for travelling families. A full list of recommendations is beyond the scale of one post, so instead, I’ll just touch on a few of my favourite things to do in Kansai with kids. Home to cities such as Kyoto, Nara and Osaka, the Kansai region of Japan is a fascinating place full of family fun. This ancient structure is the recipient of numerous superlatives, including the world’s oldest wooden building and home to a 500-ton bronze Buddha. The Todaji Temple is also one of the most interesting temple grounds to visit with kids. Its gargantuan interior is populated with other massive objects, such as larger-than-life wooden gods and a specific wooden pillar with a hole in its base. Those who can fit through the hole, it is said, receive enlightenment, but don’t expect to go through yourself: Only children can really fit. 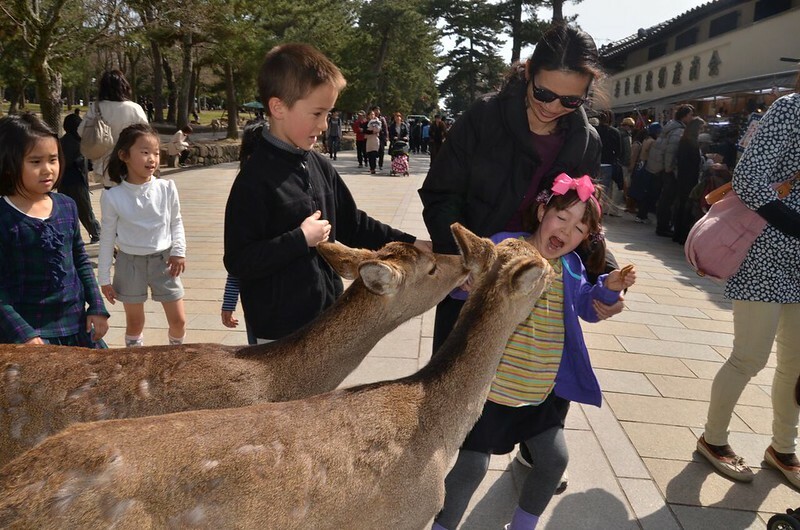 In Nara Park surrounding Todaiji temple, you’ll find deer so tame and confident that they’ll grab the snacks right out of your hands. Seriously. These creatures are basically harmless and the kids will enjoy feeding them, but it can be a little scary for little ones. Make sure to keep all food stored in your packs or you may find it in a deer’s mouth before you know it. No trip to Nara with kids is complete without a visit to Ikoma Amusement Park. This Nara attraction sits high up on a hill, muck like Tibidabo in Barcelona. What makes this Nara for kids attraction unique is that you need to take a cable car up the hill to reach the Amusement Park. The Ikoma amusement park has small rollercoasters, go-carts, miniature golf and indoor games popular for children age three and up. Like most amusement parks these days there are stage shows for Nara kids featuring popular superheroes and anime characters. Any visit to Kansai with kids includes a day or two in Kyoto, but don’t just stick to the temples and shrines. Kyoto offers families much more than heritage sites. The flavours and textures of traditional Japanese sweets may be new to your kids. Whether you like it or not (my kids LOVE them) it’s hard to deny their beauty. They’re also a lot of fun to make. You and the kids can learn to make these sweet little jewels at a variety of confectionaries around the city. Kyoto is a town made for long, pondering walks. This two-kilometre stretch north of the city isn’t to be traversed for its “wow” factor, but more because of the peaceful calm and quirky shops encountered along the way. For parents of small children, keep in mind that there are long stretches of the path near the creek without a guardrail. 2 Hour historic walking tour. Take a walking tour in an old capital of Japan, Kyoto. 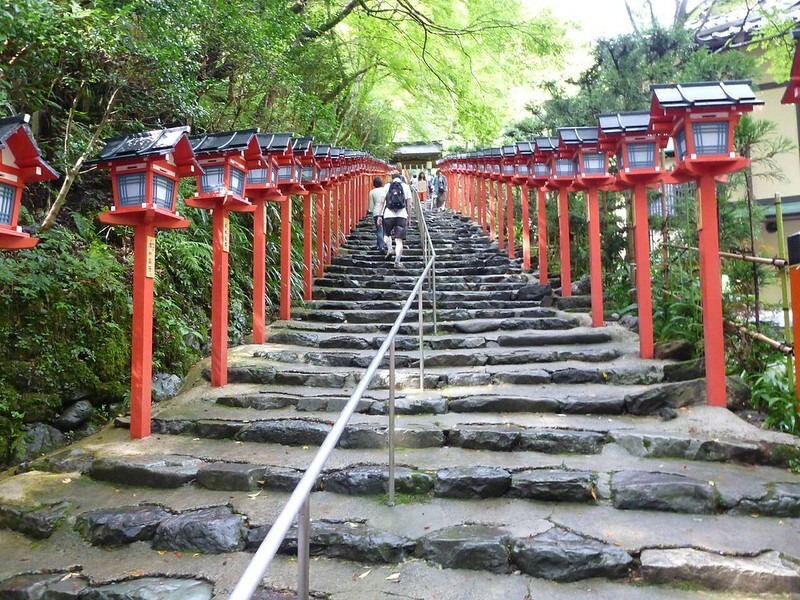 Enjoy walking for two hours from Yasaka Shrine to Kiyomizu Temple, one of the most popular ways of exploring Kyoto. For more information and booking details about this amazing walk click HERE. Less than an hour north of Kyoto by train is one of my favourite family hikes. The trail from the village Kibune to its counterpart on the other side of Kurama mountain takes only a few hours at the most leisurely of paces and is easily navigable by even primary schoolers. Just be careful on the Kurama side. The stone steps there are more civilised but occasionally slippery. When visiting Kyoto with kids the Iwatayama Monkey Park will be a bit hit. The park is home to 120 snow monkeys or otherwise known as the Japanese macaque. The Monkeys are human feed but are still wild animals so all instructions should be followed when interacting with these animals. You can buy food and feed the monkeys chunks of apples. The Monkey park has a path running through it that winds its way around the mountain. Expect to spend 1-2 hours at the park enjoying the monkeys. On its surface, Osaka isn’t a particularly beautiful city. Many of its citizens don’t come across as poised or sophisticated, and the drinking and dining scene can be quite loud and uncouth. Yet despite this rough exterior, Osaka is an amazing place to eat, drink, explore, and make friends. Osaka hop on hop off bus tour. Take in the city of Osaka from an open top, sightseeing bus. There are 13 bus stops on the route and you can easily access major sightseeing spots from each bus stop. Your 2-day ticket provides unlimited access to all stops, allowing you to hop off when you want to explore more. These type of tours are great if you are in Osaka with kids. Sit back and relax while the kids enjoy the bus ride. Book your hop on hop off tickets HERE. You know this one — you’ve seen the pictures. This vibrant shopping and nightlife district is even more vivid than any image that a Google search can pull up. Just keep in mind that many of the restaurants close at 10 pm or earlier. The Japanese onsen (hot spring) experience can be a soothing and almost sacred affair. A trip to Spa World is something completely different. 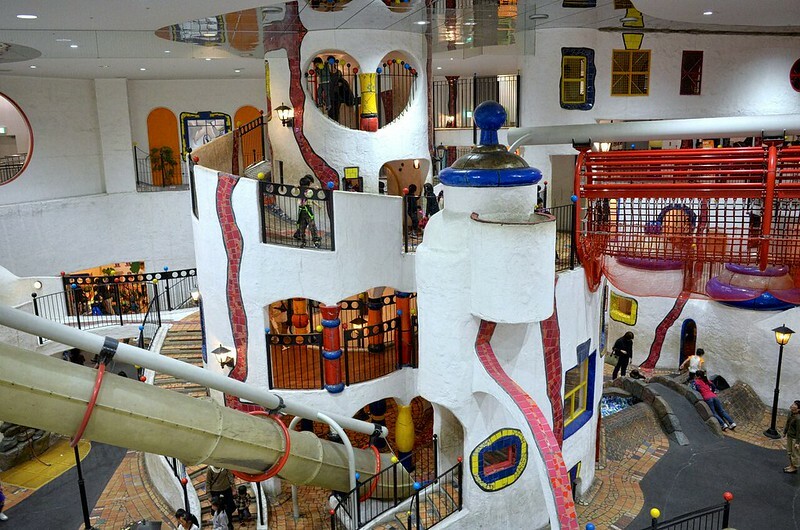 Wild, loud and garishly decorated, this 5-floor indoor waterpark has gender-specific floors to explore regional-themed tubs, while the roof has glassed-in waterslides and a lazy river. It’s all heated in winter, which has made it part of our family’s New Year tradition. Classy it ain’t, but hey, neither are we. A large castle with a history that included intense battles that changed the course of Japanese history. The castle tower is surrounded by gates, stone walls and moats The castle itself is a reconstruction with a modern interior that houses a museum of the castle’s history including Samurai artifacts. All kids know the Samurai and the swords on display are a huge hit. The Nishinomaru Garden is a lawn garden with 600 cherry trees on the site of the castle. The park is one of Osaka’s most popular spots in Osaka during the cherry blossom season, which usually takes place in early April. Agoda.com has over 2600 properties in the Kansai region including hotels, apartments, and guesthouses. You get a free cancellation on most rooms and the best price guarantee. Nara to Osaka – 30.5 kilometres. Driving time is around 1hour 7 minutes, Train time is around 1 hour 6 minutes. Kyoto to Nara – 45.5 Kilometers. Driving time is 58 minutes. Train time is around 1 hour 15 minutes. Osaka to Kyoto – 56.4 Kilometers. Driving time is around 1 Hour 2 Minutes. Train time is around 1 hour 8 minutes. 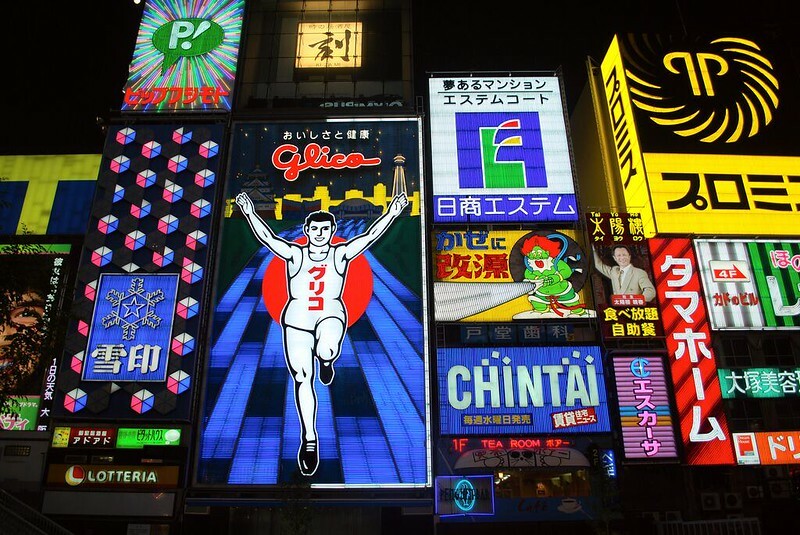 Have you been to Kansai with kids? Where did you go? What fun did you find? 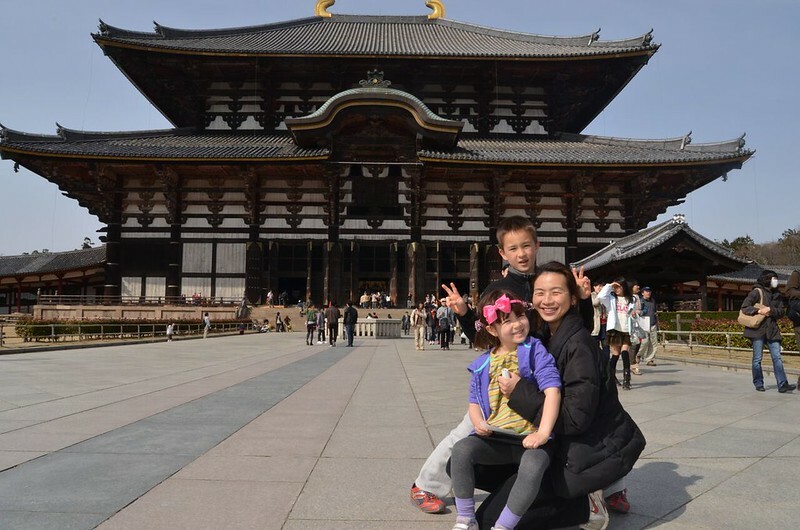 Visiting Kansai with kids is much more than Osaka, Kyoto and Nara. There are other major cities like Kobe and Wakayama, but there are also amazing mountains, beaches and other natural surroundings to explore. Tell us where you enjoyed! This sounds great! I only got to explore Kyoto while I was in Japan, so when I go back I’m DEFINITELY checking out Nara and Osaka. It’s good to know you can travel with kids as well! I love that you incorporated family-friendly activities and photos of your little ones in this post! Such a great guide! It’s so empowering to see how families travel with kids – props to you! I love seeing people travel with their children. I’m not quite there in life yet, but it inspires me for when I will be in the future. I love that you guys find a nice mix of things for the adults and the kiddos! Thanks for sharing! I sadly did not get to this part of Japan when I was there which is sad as it looks amazing. I can’t really imagine dragging my step-kids to Japan though as they would whinge after an hour in the car and I possibly would have wanted to throttle them. Fair play to those who do it, they must have the patience of a saint.